Terrorism struck the civilized world again over the weekend. This time the attackers hit Paris. The horrific events and loss of life are tragic. My heart goes out to those that have been impacted by these events. Needless to say, terrorism is back at the top of the agenda for world leaders. I hope for swift justice for those that planned and executed these cowardly acts. As ugly and appalling as these attacks are, we are no longer surprised by them in a way we once would have been. We already lost our innocence and we understand that there are risks that come with freedom. The most important thing we can do as members of the civilized world is continue to live our lives as free men and women… albeit with a bit more caution and awareness than we did before. The financial markets are taking a sober look at these events as well. 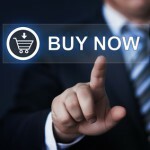 There’s sure to be an impact to the economy near these events. And it could cause some negative impact to tourism and travel. But these events don’t change the trajectory of the global economy. There are things to be concerned about in the global economy. Things like the strong US Dollar, weak commodity prices, and a slump in US imports ahead of the holiday season. The big question right now is this… How much of the weakness is behind us and already baked into the cake? Over the last week, the S&P 500 slumped lower after nearing the all time highs. The pullback erased most of the gains over the last month. 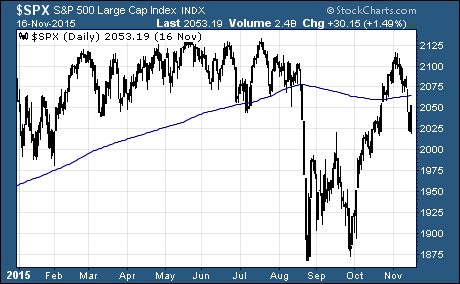 And it sent the large cap index back below the 200-day moving average. But the S&P 500 is still a full 13.5% above the August lows. So, the correction and breakdown below support of the 200-day moving average needs to be taken with a grain of salt. Don’t forget, the stock market is forward looking. What happened last quarter or this quarter isn’t as big of a deal as what investors expect to happen six months or a year down the road. Identifying industries with positive macroeconomic themes is a critical part of the Sector ETF Trader strategy. Sector ETF Trader identifies high-return potential ETFs based on a number of macro, fundamental, and technical indicators. These indicators offer you the opportunity to participate in some very large moves in a relatively short amount of time. And because it focuses on ETFs, you get the advantages of both stocks and mutual funds, without the problems of high fees and over-concentration. Rather than taking a ‘shotgun’ approach to the market, I use a time-tested system like a scalpel to carve out those ‘hidden gems’ with the greatest chance of spectacular profits. You can develop an ETF trading system like mine or you can let me do the heaving lifting for you. It’s not too late to pick up the most recent issue of the Sector ETF Trader. But you’ll need to take action now to avoid missing out. Click this link to find out more about this easy method to identifying the most profitable sector ETFs around!